Because finding new friends as a first-time mom can feel like dating all over again. Challenge: After moms given birth, there are few non-exerting opportunities to network with other new moms and moms are not warned of the difficulty finding friends after birth. Solution: Apply the ease and convenience of dating apps to a platform made specifically for moms looking for new mom friends. Finding new friends post-birth is nearly impossible while new mothers are experiencing postpartum, and finding new friends during pregnancy is a subject not many people are talking about. When receiving advice from professionals and experienced mothers, moms-to-be are not warned of the importance of finding new friends during pregnancy, even though experienced moms wish they had prioritized. More importantly, moms wish they’d been advised to be proactive about finding new friends while pregnant because once baby comes, this becomes quite difficult. There is an opportunity to create a simple and convenient way for moms to connect both before baby arrives or during postpartum that do not require exceptional amounts of energy. 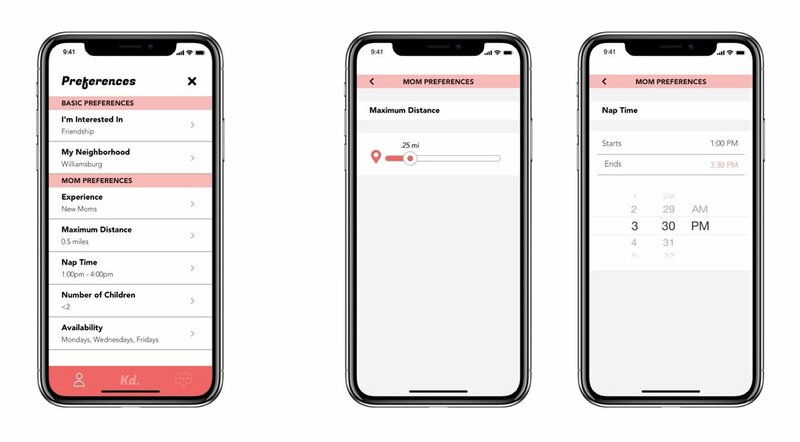 Kindred is a mobile app that connects moms based on a maximum distance radius and stage of pregnancy and/or motherhood. All of Kindred’s preferences are mom-specific. Is it possible for new mothers to prepare for motherhood? During the workshop, I asked three primary questions. The first corresponded to their experience during pregnancy, asking what type of advice they were given (solicited or not) about how birth and pregnancy would feel and change them. The second question asked what information was missing from their pre-birth advice that would have made them more prepared for postpartum. The final question asked what advice would they give to moms-to-be, based on their lived experience of birth and postpartum. 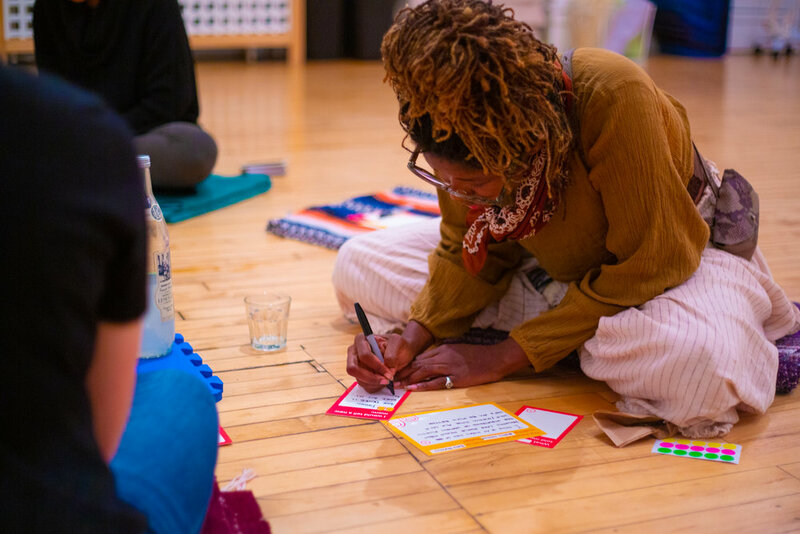 These prompts were broad to facilitate conversation about postpartum, but specific enough to focus on the dynamic changes that happen within a mom’s support community. Our conversation ranged discouraging comments from coworkers to methods for building familial and friend relationships from zero again. There was a clear consensus that moms should prioritize new friendships before birth to have reliable support during postpartum. Other insights stressed the fact that new mothers are most times quite unable to engage in physical activity in the weeks immediately following birth. Healing time is just as crucial as identifying support, and so, a mobile application allows for in-home use without physical activity, which is further acknowledged by the fact that matches are only made within tight radiuses of activity, because mobility is an obstacle by itself let alone adding a child transport. (Left) Recruitment tactics included the creation of invitations and posters promoted through social media and network outreach from a pool of previous interviewees. 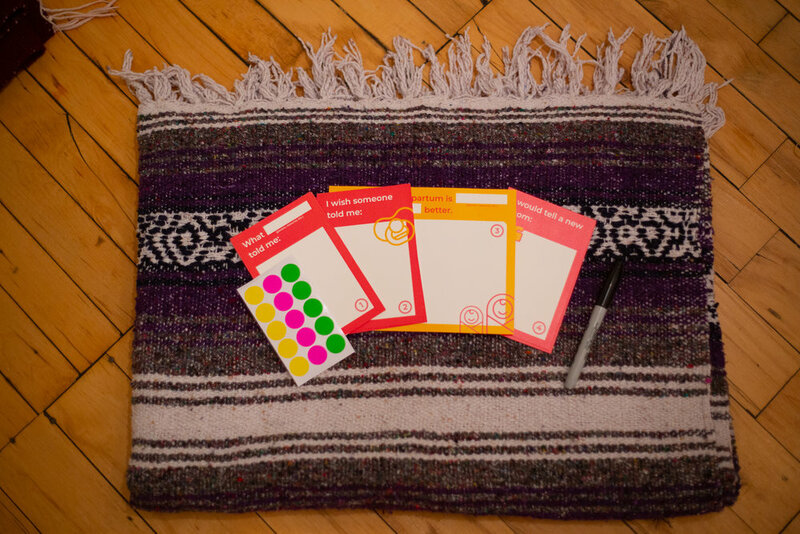 (Right) Designed cards were created to facilitate workshop conversation and are numbered to create structure for participants. No drawings necessary; there is room for only short phrases, which relieves pressure for participants. 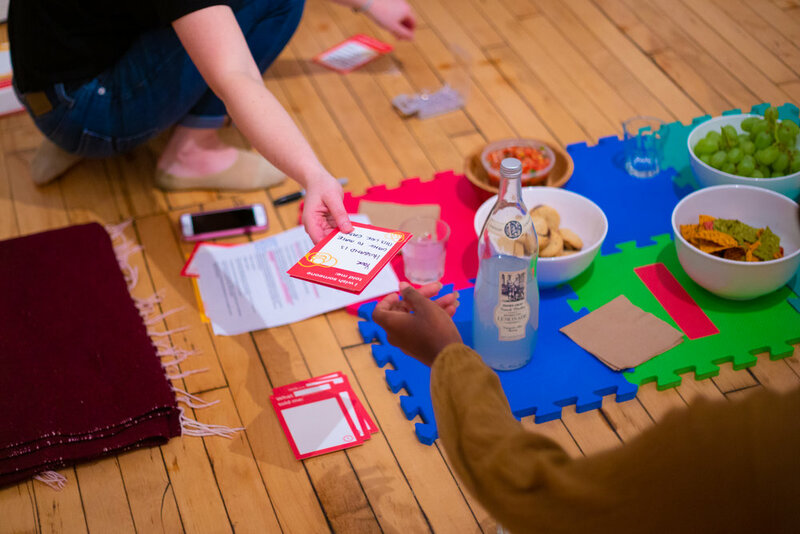 The space for the co-design workshop was provided in partnership with Babies Project in Chelsea, NYC. Photography and video were generously directed by Evie Cheung and Manako Tamura, respectively. All Hiatus Kindred Moxie: The Boutfit With Grit The Datalogue Overt Slidekick: No Swipe Is Off-Limits Know Her Flow with Racket. Hiatus Kindred Moxie: The Boutfit With Grit The Datalogue Overt Slidekick: No Swipe Is Off-Limits Know Her Flow with Racket.